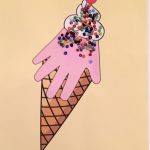 This Candy Sundae is an easy and fast candy craft project and it is as much fun to make as it is to eat! 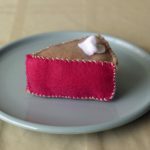 It would also make a fun party favor for guests to make and take home for sweet memories for a long time to come. Trivia: The sundae is a sweet ice cream dessert. It typically consists of one or more scoops of ice cream topped with sauce or syrup, and in some cases other toppings including sprinkles, whipped cream, maraschino cherries, or other fruits. Prepare a Sundae glass. 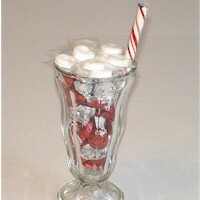 In this case a 3.5” diameter x 6.5” height sundae glass. 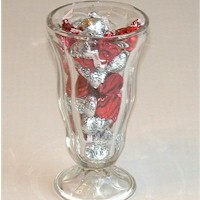 Fill the Sundae glass with the Hershey’s chocolate kisses. Insert the stick candy of the corresponding color into the glass. Put Life Savers candy on the top representing “whipped cream”. You may use mini glue dots to hold these candies in place. Take curling ribbons of several colors that match the kisses wrappers. Or you can buy a ready curl swirls. Take a piece of chenille wire and tightly wrap it around the middle of the curling ribbons. Instead of chenille wire you can use white stem wire. 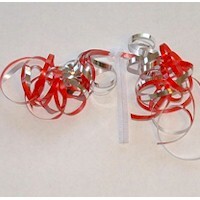 Curl the ribbons by pulling them over the edge of the scissors. Insert the curling ribbons in your arrangement. 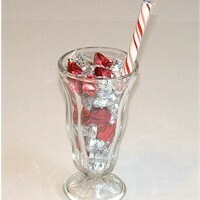 Your Candy Sundae with chocolate kisses is ready! See the photos below for step by step illustrations.